120 years of film in Sussex celebrated, commemorated and chronicled in an exclusive book. 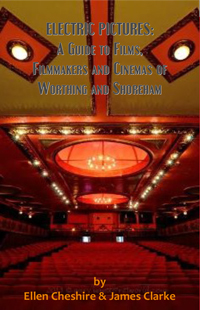 Written as part of the Worthing WOW festival celebrations, ‘Electric Pictures: A Guide to Films, Filmmakers and Cinemas of Worthing and Shoreham’ captures the county’s rich cinematic legacy in all its glory with contributions from local historians and film and theatre specialists. From film pioneers and dreamers through to blockbuster films, the south coast has always had a rich movie-life. This book is your one-stop guide to the places and faces, key events and films that comprise this fascinating stretch of the south coast from Worthing to Shoreham and its place in British film history. The book is your tour guide and builds its journey around three sections: Cinema-going, Filmmaking and a Heritage Trail indicting key filming locations and cinemas (both lost and surviving). The guide draws on research into press archives, film archives and local history resources to tell the story of the south coast film world.